We ship plastic playground border timbers nationwide. All of our plastic border edging is made in the USA! To get a custom quote, simply fill out the Request Form or call us direct at 877-840-0707. 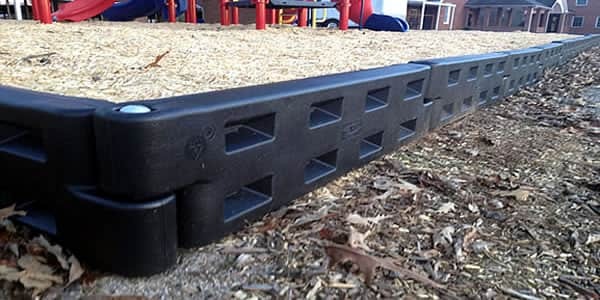 Plastic border timbers have a variety of uses and make a great addition to any playground. Our borders are Made in the USA! These borders are most commonly used as borders around the perimeter of a playground. 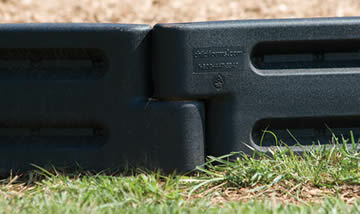 They provide a retaining barrier for loose-fill resilient surfacing and add a finished edge to the play area. Other uses include sandboxes, dirt boxes, landscape borders and flower boxes. 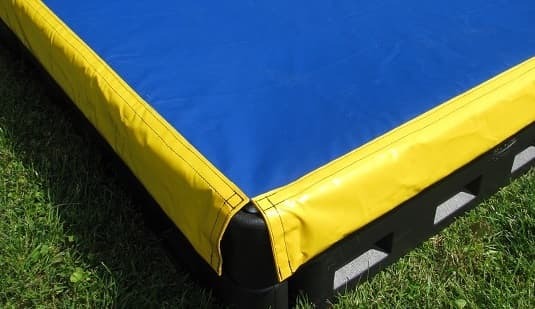 Plastic borders are modular and easy to install, which make them great for both commercial uses or backyard play areas. These timbers come in 3 finishes — plain, stone-themed, and rock-themed, making them great for safe and durable accents, without sacrificing style. The black plastic timbers are all made from 100% recycled plastic. Why Purchase Playground Border Edging from Playground Equipment USA? 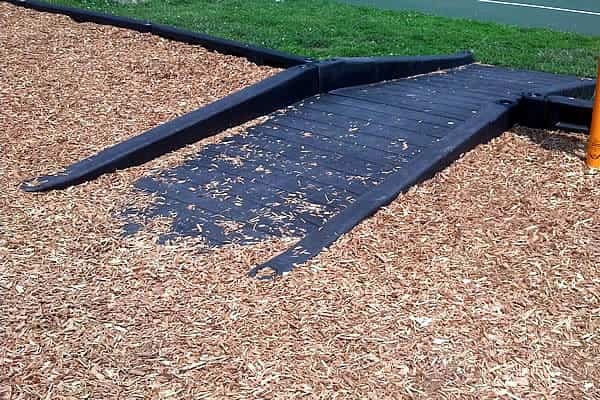 Our staff members actually have experience installing these plastic timbers in dozens of playgrounds, but many of our competitors have never even handled a timber. 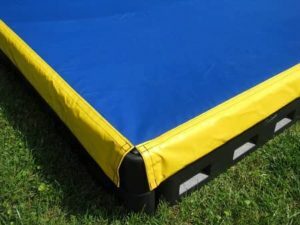 If you have questions about purchasing plastic bordering or need a custom quote, just phone us at 877-840-0707 between the hours of 8:30 am to 5:00 pm Monday thru Friday. You may also fill out the contact form on the right or a request a quote form. Many of your customers are schools, municipalities, churches, private businesses and even homeowners. To save you money, we offer multi-point shipping from various locations in the USA! You can find out more about our product at plasticborders.com. Need a Custom Quote, including shipping? Just give us a call at 877-840-0707. Most of our customers are schools, businesses, municipalities, churches and various organizations. 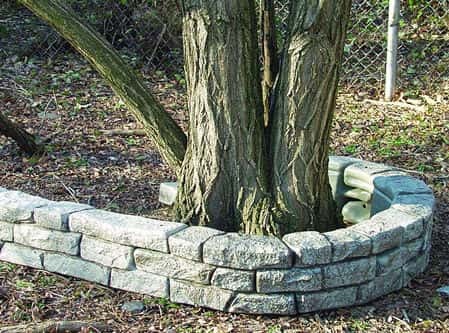 These borders are particular great with gardens and playgrounds or any other type of project you are working on. 1. Determine how many border timbers you will need for your project. Calculate the linear length and width of your project and divide that the length of the timber. (Example: If you have a length of 20 feet and width of 8 feet, you will need 14 of the 4′ plastic borders. 2. Fill out the request an estimate form or call us for an estimate at 877-840-0707. An estimate will include the price of the plastic borders plus the cost for shipping. 3. We will email you back a custom quote. Once you are satisfied, you can call us back and pay over the phone. We accept Visa, MasterCard, American Express, Checks and Purchase Orders.